Many apologies for the blatant self-promotion but I hope that you all can forgive me for enclosing this wonderful review of Ahead Of The Game which was written by Tim Street – obviously a really talented and observant book critic – in today’s online newspaper Get West London. Many thanks Tim for your kind and perspicacious words! I am really knocked out by them. 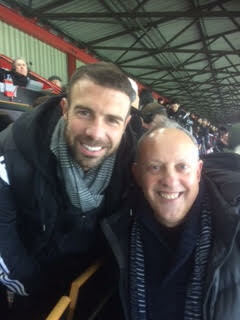 Brentford blogger documents a season to remember! It all started by trying to kill some hours on a flight home from Spain by writing about his favourite football club. A year later, the end result was a book documenting Brentford’s most exciting season in living memory, as they took the Championship by storm and so nearly landed a top flight spot for the first time in 70 years. Over the course of the season, Greville Waterman, who was, by delightful chance, celebrating his 50 year following the Bees, wrote more than 200 online blogs which he has now put into print with a book, Ahead of the Game . He said: I was sitting on a plane back from Spain last June with some time on my hands and just started writing, and the words began to flow. There weren’t any times I struggled for inspiration. Frankly, it was harder to stop writing than start as I wrote over 225 blogs, and nearly 300,000 words, over the course of the season. My favourite was one I wrote one last December about what Griffin Park means to me and how it has become part of my life, which I am pretty proud of. As for my least favourite, I could have done without all the articles immediately after Times-Gate last February (when the fact that popular manager Mark Warburton would be leaving at the end of the season whether the Bees were promoted or not was leaked to The Times). And yes, last season would have been too soon to go up both on and off the pitch, but carpe diem, when the chance comes you need to grasp it and we let it slip. Harsh but true. If you read Ahead of the Game, you will see that my expectations changed after the Bournemouth away match in August. I was concerned until then, but after we had totally outplayed the ultimate champions on their own turf I knew that we would do far better than establish ourselves. I have to confess that on the long drive back from Leeds in February (Brentford won 1-0 at Elland Road) I allowed myself to dream of the promised land of the Premier League – and then Times-Gate broke a few days later. One of the consolations for failing in the play-offs was two more derbies against QPR, relegated from the Premier League, next season, which are bound to bring the memories flooding back for Waterman of his debut season half a century ago – when Brentford’s last glory era was coming to an end and years of decline were about to set in. He said: My first game was in 1965 as a callow youth, and we beat QPR. 5-2. On my second visit we beat them 6-1. I thought Brentford were world-beaters. Not for too long though! As for next season, with so many changes on the pitch and behind the scenes, I suspect that it might take us a little time to gel. As long as the players buy into the new coaching team and we retain the amazing team spirit and will to win of last season we will do just fine. Maybe even better than last season as we are certainly bringing in quality players. But will next season – under the new era of Marinus Dijkhuizen as head coach, with players scouted using, alongside more traditional methods, a ground-breaking stats-based approach – be blogged and documented too? Waterman added: I have started writing articles already this pre-season, and my blog, BFC TALK, can be found at bfctalk.wordpress.com. I hope to write a new book the same length next year as I am sure that there will be lots of new material both on and off the pitch. 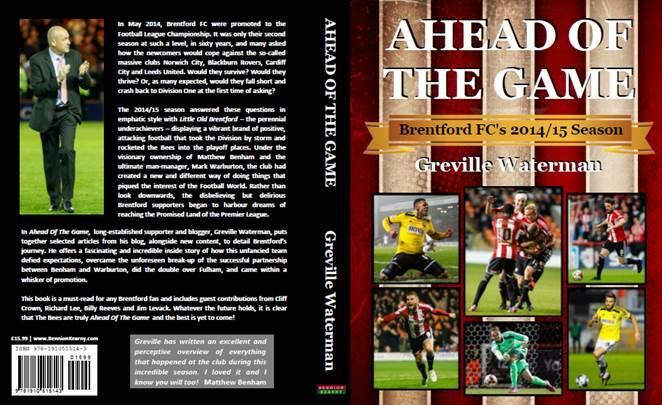 Ahead of the Game, by Greville Waterman, is available in the BFC Superstore and can also be be obtained as a paperback or eBook on Amazon. 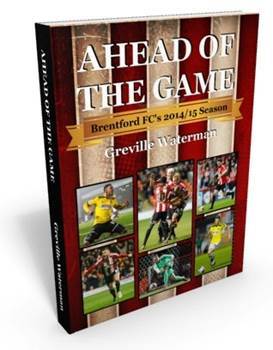 The book is 408 pages long and includes a paragraph of endorsement from Brentford owner Matthew Benham. Just to let everyone know that as of today Ahead Of The Game is now available to purchase either as a paperback at The Brentford FC Superstore or it is can be bought as a paperback or Kindle eBook on Amazon. 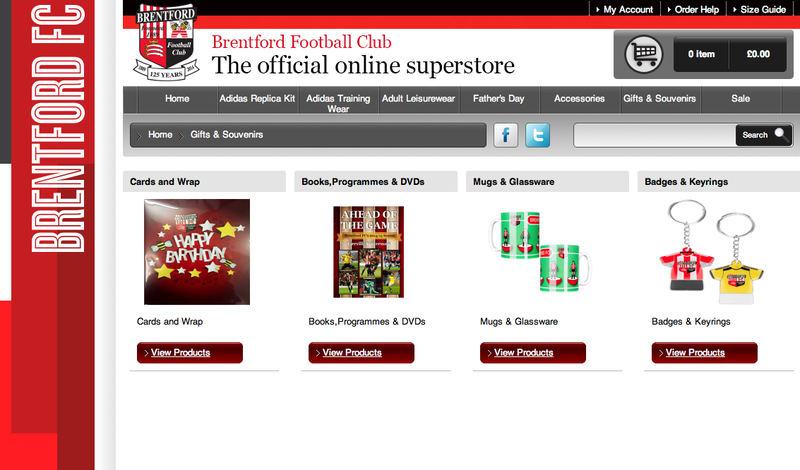 The book is available in the Brentford FC Superstore . Note: Amazon is currently displaying “Usually dispatched within 1 to 3 weeks”. Please be advised that stock is shipping to Amazon right now, so customer copies should be shipping out very soon. I really hope that you enjoy it and that you think that it gives an accurate and ideally, entertaining, account of all the incredible things that took place both on and off the pitch during what was certainly the most amazing season for Brentford FC within living memory! I just wanted to give everyone a quick update regarding my BFC Talk blog. I have kept it going since the middle of June last year and inflicted over 220 articles and the best part of 300,000 words on you all! I have been planning a book for the last few months and have been really fortunate to find a sympathetic publisher in Bennion Kearny who liked the idea and agreed to bring it to fruition later this summer. I’ve spent the last week or so finishing up the book, which contains edited versions of the best of my blogs, as well as writing a final long article which summarises the season overall, explains our success and how things could have gone even better, and also suggests how next season might well go given the changes that have just been announced at the club. For those of you who, quite reasonably, are fed up with me, there will also be three new fantastic guest articles which will be featured in the book as well as several other previously unpublished pieces. Richard Lee has written a detailed player’s perspective on the season as well as providing his impressions of both Matthew Benham and Mark Warburton and how they worked together. His article is really interesting, incisive and thought provoking and he provides an authentic insider’s view on an incredible year. The Maestro, Billy Reeves has written a generous and justified appreciation of Mark Warburton given his experience of working with him over the past couple of years and Jim Levack has also paid fitting tribute to retiring colossus Kevin O’Connor. We have also just come up with the title Ahead of the Game which hopefully sums up where we are in our journey towards the Premier League. Mark Fuller has also kindly allowed us to cherry pick some of his best images from the last nine months or so and his brilliant photographs are interspersed throughout what will be a meaty four hundred page book. Ahead of the Game will be available both as a paperback and Ebook later on this month and I will provide you with more information as and when it becomes available regarding how you can get hold of a copy (hopefully from the Club Shop or via Amazon) and how much it will cost. I will also be making a contribution to Brentford FC out of any royalty payments that I receive. In the meantime, here is how the front cover will look. I hope you like it. As for me, I now intend to take a short break from writing. Candidly, I’m not sure as we speak whether or not to continue with the blog next season and would welcome your views. I have really enjoyed writing it but it has all become a bit overwhelming given the length of some of my articles and the need to keep things up to date and contemporary and I don’t want to run out of things to say. Anyway, that is all for the future. As for now I simply want to thank everyone who has read any of my stuff, I hope that you have enjoyed it and maybe some of you are gluttons for punishment and even want some more! I also hope that you will decide to buy the book when it comes out as it will hopefully provide you and every other Brentford supporter (Christmas present perhaps?) with some suitable and entertaining and maybe even thought provoking memories of what turned into a quite remarkable and unforgettable season and how we indeed became Ahead of the Game.